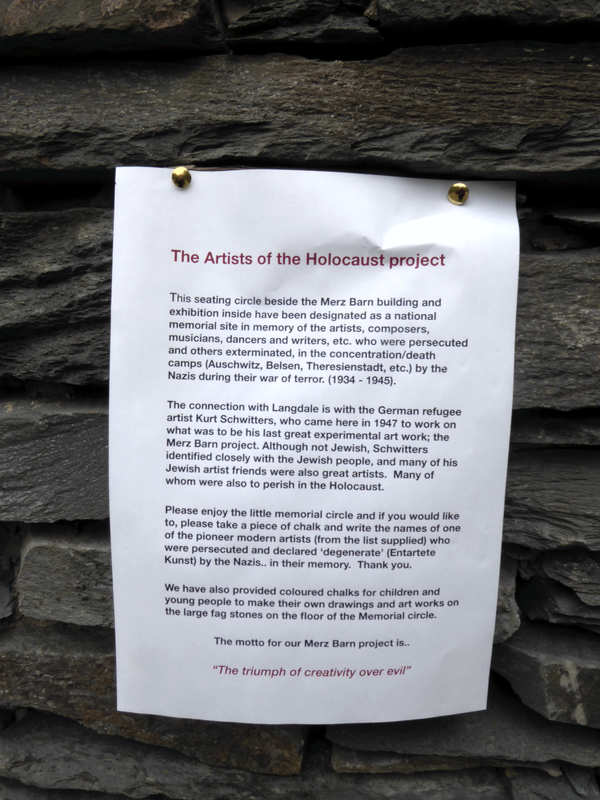 It was through the Wiener Library in London, and later Sir Simon Schama’s BBC Civilization TV series – in particular the programme ‘The Vital Spark’, about the children’s art project in Theresienstadt, that we at the Merz Barn were inspired to develop the concept of the ‘Artists of the Holocaust’ memorial project at the Merz Barn site. Encouraged by their heroic art teacher Friedl Dicker-Brandeis, the children in the Theresienstadt concentration camp created images conjuring up the lives and hopes of which they were being deprived, and Schama’s programme is a poignant tribute to the power of art to sustain optimism in the face of adversity. 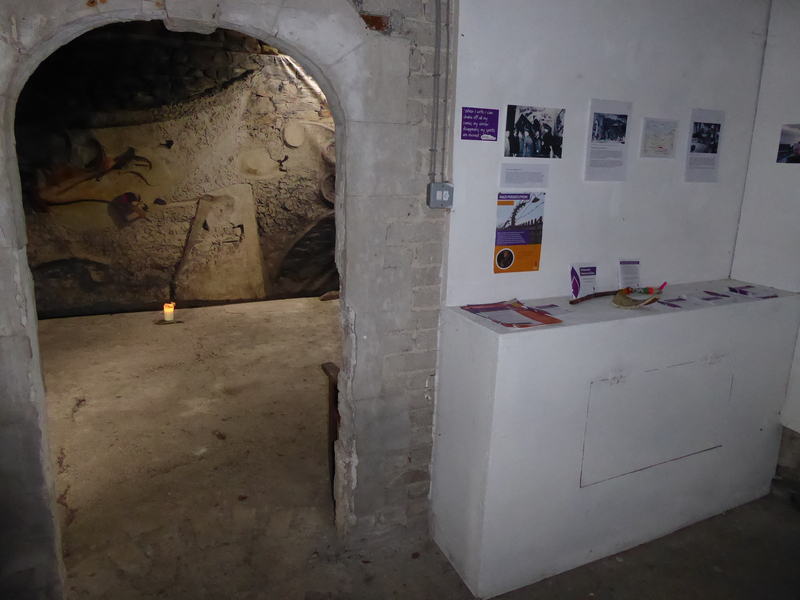 Artists and the Holocaust Exhibition in the Merz Barn Cake Room. 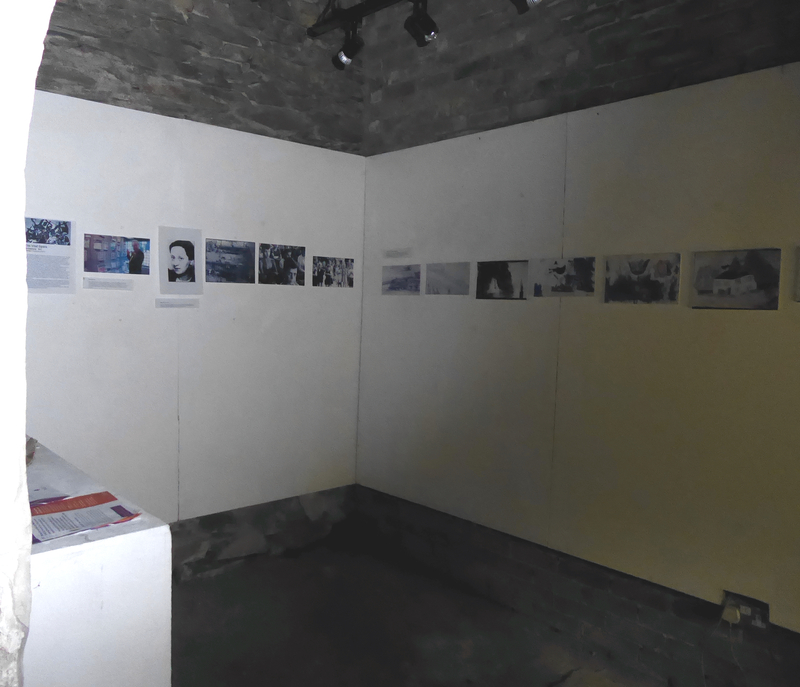 The ‘Cake Room’ exhibition space, and the seating circle outside the Merz Barn, are designated as a memorial to the artists, composers, musicians, dancers and writers, – and children – who were proscribed by the Nazis during their campaign of terror (1934 – 1944, or exterminated in the concentration camps of Auschwitz, Belsen, Theresienstadt, etc. The connection with Langdale is through the German refugee artist Kurt Schwitters, who came here in 1947 to work on what was to be his last great experimental art work; the Merz Barn. Although not Jewish, Schwitters identified closely with the Jewish people, and many of his artist friends were Jewish. 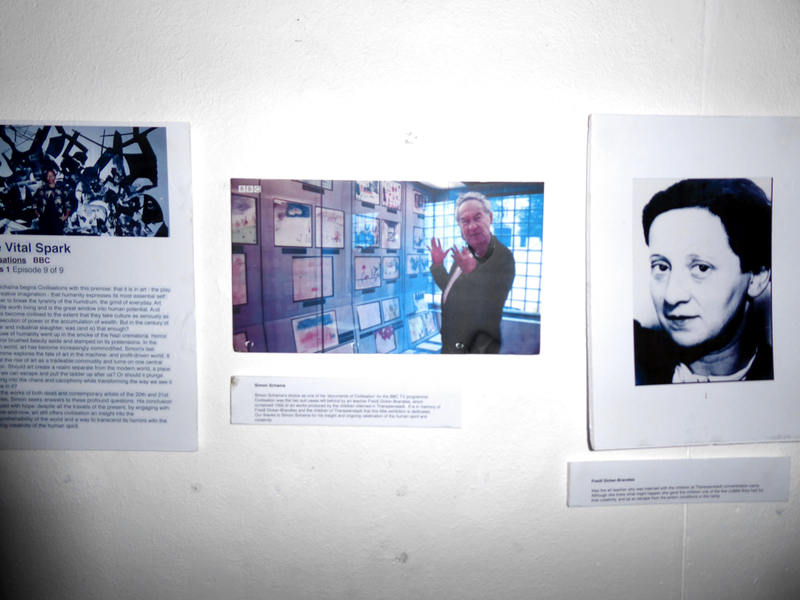 Alongside the ‘Artists of the Holocaust’ exhibition we are continuing with the Entartete Kunst documentation project. Over the summer and autumn we are planning a number of exhibitions, seminars and events to commemorate the artists who, like Kurt Schwitters, were declared ‘degenerate’ (entartet) by the Nazis. As a part of this we have a list of the names of the artists included in the infamous ‘Entartete Kunst’ exhibition in Munich in July 1937. 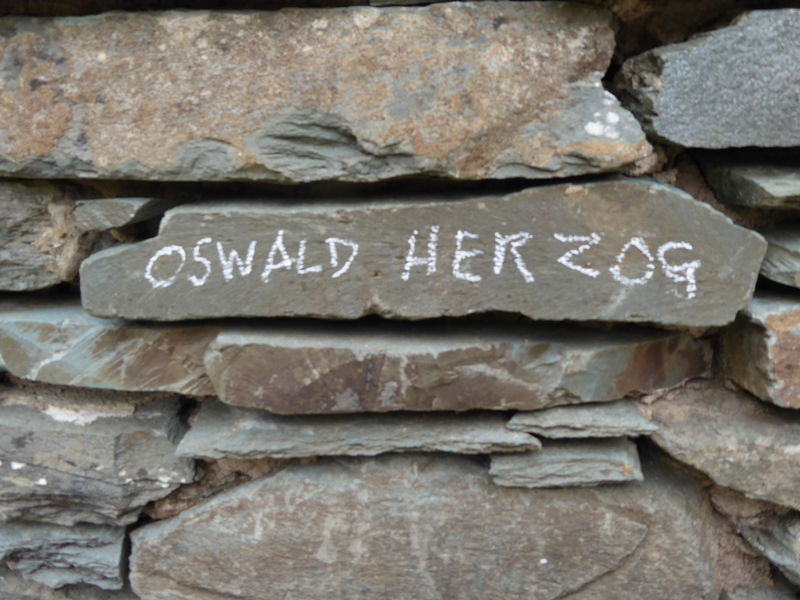 We invite visitors to the Merz Barn, and the ‘Artists and the Holocaust’ exhibition, to help us celebrate the artists’ names by writing them in chalk on the end wall of the Merz Barn. Please enjoy the little memorial circle and, if you would like to, take a piece of chalk and write the name of one of the artists (list supplied) persecuted and declared ‘degenerate’ by the Nazis, on the wall of the barn. Artist Jill Rock with Ian Hunter in 2013 after the artists’ names have been chalked on the Merz Barn wall for the first time. Coloured chalks are provided for children and young people to create their own drawings and art works on the flag-stones flooring the Memorial circle. The motto for the Merz Barn project is..
On Saturday October 27th 2018 Pip Hall finished carving the inscription of a saying by Kurt Schwitters on a found glacial erratic boulder at Cylinders. The work was finished in time for the annual Reading of the Names of the artists ridiculed by the Nazi régime in the Degenerate Art Exhibition in Munich in 1938. This moving ceremony was led by the vicar of All Saints church, Chapel Stile, George Wrigley, and, in a departure from our usual practice, took place in the candlelight inside the Merz Barn. At the 1937 Munich exhibition of ‘Degenerate Art’ a .painting by Kurt Schwitters is hung deliberately upside-down and at an angle, as seen here above the Führer’s head. 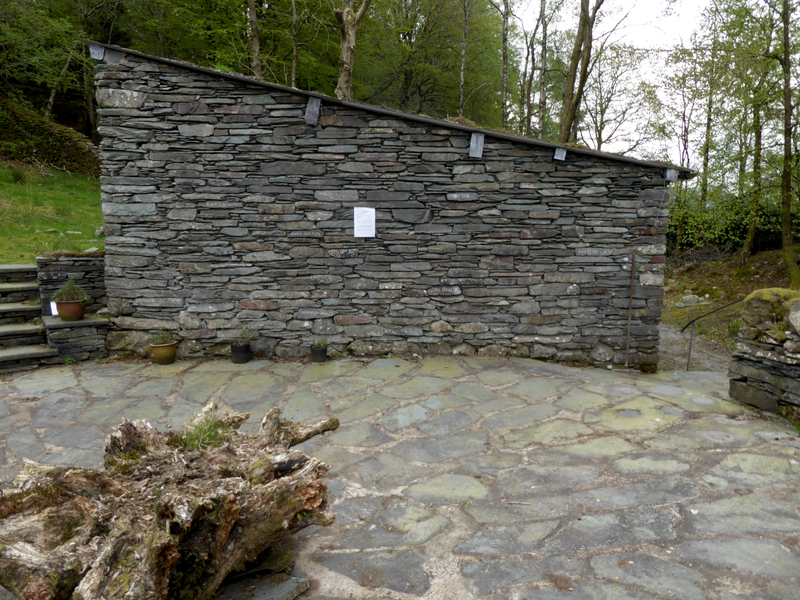 Schwitters could have been partly inspired to produce the Elterwater Merz Barn in response to the utter destructiveness, barbarism and racism of the Nazis. Artists and community gather to commemorate the many artists who were declared degenerate (entartet) by the Nazis, and to honour the countless other artists, gay people, Roma, Seventh Day Adventists, Black Africans, Anabaptists, and people with disabilities who perished in the Nazi death camps*. *This year, inspired by Professor Simon Schama’s wonderful The Vital Spark, (Civilisation No. 9, BBC TV documentary) we will be remembering the little Jewish girl Helen Mandlova, who was murdered by the Nazis in the Theresienstadt concentration camp. We will also be honouring the ‘unquenchable creative fire’ of the other child artists of Theresienstadt and their courageous and gifted art teacher, Friedl Dicker-Brandeis. BBQ (free soup and home-made bread, BYO bottle) – all welcome! OUR CONTRACTORS COOK & LAKIN HOPE TO COMPLETE THE BUILDING BEFORE CHRISTMAS. The 70th anniversary of Kurt Schwitters’ death in January 1948 fell on January 8 1948. The occasion was marked by a short memorial programme in the Queens Hotel, Ambleside on Sunday, January 7th, with performances by Florian Kaplick and Ian Hinde on and about the Ursonate. This was followed by a dash to Strickland Court in Kendal, the site of the old county hospital in which Schwitters died. The Lakeland Fiddlers braved the bleak weather to play a memorial tribute, flowers were placed on an approximation of the site, and then everyone retired to Cylinders where there was a barbecue with performances by Steve Grundy and his various instruments. Article in The Guardian, 8.1.18 N.B. The Merz Barn photo used was taken in 2007. On January 8th an article appeared in The Guardian reporting the possibility that the Merz Barn might be sold to an arts entrepreneur in China if funding to keep it going were not forthcoming in England. It is the case that the Littoral Trust has received several enquiries about the possibility of buying Cylinders, one of which was from China. The article, together with a filmed piece on ‘Look North Tonight’, helped to raise public awareness about the future of the Merz Barn. Happily the issue has been resolved, for the next two years at least, and the Trustees are actively pursuing various avenues for the safe-guarding of the buildings and the site after that. Traditionally we mark the Jewish Holocaust Memorial Week in January with a celebration of our own, remembering all the groups persecuted for ‘deviance’ by the Nazi regime in Germany: beside the Jews they attempted to annihilate Black people, anyone with mental or physical problems, Gypsies, Seventh Day Adventists, and artists working in Modernist genres. On the evening of January 26th we invited our regional Rabbi to join in a memorial event in the Merz Barn, together with the vicar of All Saints church, George Wrigley, a Buddhist, an Adventist, and others. A small exhibition was opened featuring a rug, hand-woven in Afghanistan to a design by artist Jim Ricks ‘Tread Carefully!’, based on a slogan by George Grosz displayed at the First International Dada Fair in Weimar in 1922. Translated, the text runs: ‘Take Dada seriously, It is worth it!’ (www.jimricks.info). As usual the winter gales saw the fall of several of our vintage birch trees. Self-seeded, these have a short life of around 70 years, and are especially vulnerable when they stand on shallow earth. Mike Edmondson’s team came in during February to log the crop of fallen trees, happily finding no major damage this year to neighbouring beeches or conifers, or to the ancient dry-stone walls. February was also the month during which Steve Grundy finished work on the new glasshouse behind the Merz Barn, a replica of the one to be seen in old photographs of Cylinders, built by Harry Pierce during the 1940s. We are happy to announce that Littoral has been awarded a grant by LEADER/RDPE to completely rebuild Harry Pierce’s old Drawing Office at Cylinders this autumn. The architect is Andrew Shepherd, and the work will be undertaken by Cook & Lakin of Ambleside and Windermere. The ‘drawing office’ rebuild will include new gallery display space and micro museum and reading room devoted to the work and life of local garden designer Harry Pierce. 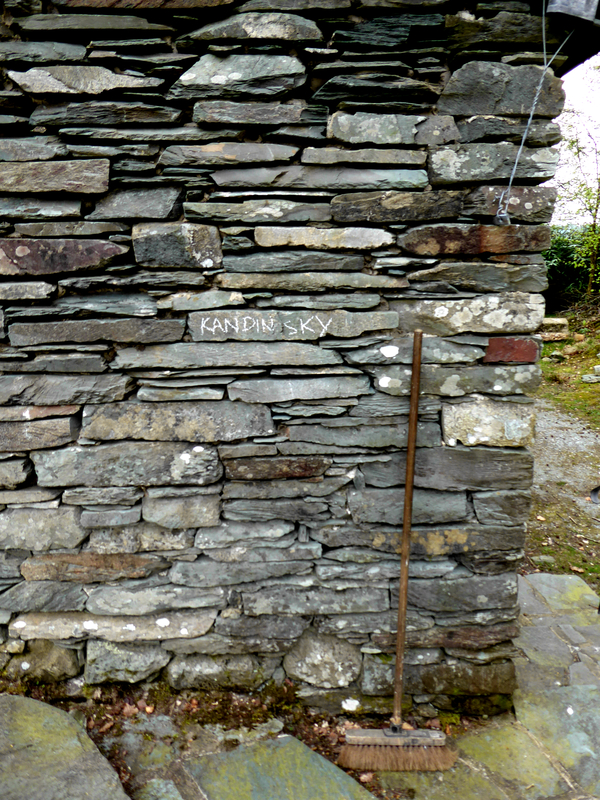 Who had first supported Schwitters while working on the Merz Barn in 1947. The artistic programme at Cylinders during 2018 has continued to expand. There have been residencies and visits for student groups from the Royal College of Art, Manchester University and Manchester Metropolitan University, the University of Salford, and the University of Cumbria Institute of Arts. Installation by a student from Salford Uni. Drawing in the Merz Barn. The KS18 Summer School was organised by members of the RCA Students’ Union led by Cat Robertson. They attended workshops on drystone walling with Steve Grundy, stone-carving with sculptor Danny Clahane, woodland crafts with Dave Middleton, collage with artist Mike Healey, and – a popular choice – trench-digging on Mike Edmondson’s digger. The weather for once was perfect. Mike Healey’s Collage workshop: loose re-creation of a work by Schwitters, now lost, (Das Merzbild 1919) included (upside down) in the 1939 Munich ‘Entartete Kunst’ Exhibition of 1939. After Mike’s workshop the ‘re-created’ collage was carried in procession to the Merz Circle where it was hung right side up on the Merz Barn wall, sections of his ‘Ursonate’ piece were read by Ian Hinde, and the event was crowned by an impromptu country dancing session to the accompaniment of Steve Grundy’s accordion. New and recent paintings by Peter Symonds. A response to the work of Kurt Schwitters. April 7 until April 28. For the last five years I have lived and worked on a Greek island. Corfu, away from the tourist sites, is a lush expanse of olive groves, secret lakes, dark forests and unyielding mountains – a landscape where ancient gods and goddesses once walked, spreading fear and veneration in equal measure. It is, therefore, a haunted island, and any artist worth his or her salt must recognize the indefinable presence of these pagan forces. Many of the paintings in this exhibition therefore have their origins in Greece, and reflect the veneration I have for ‘place’ – wherever it may be. This takes many forms, including close study of indigenous plant forms, rock formations and specific landscapes. ‘Merz in the Moment’ Exhibition in the Merz Barn and Cake Room, August 3rd & 4th (Abbott Hall Dementia Arts group). ‘Merz in the Moment’ is a long-term collaborative art project initiated by Abbott Hall Art Gallery in collaboration with the Hatton Gallery, Newcastle, with people coping with dementia and their carers. They took as their theme inspiration from Kurt Schwitters’ collages, and we were delighted when they were able to bring their project to Cylinders and display their own artwork in the Merz Barn. The artists and their carers will be returning in the new year to produce a major installation and exhibition. Chris Roberts, Head of Foundation Art Studies at the University of the Arts London, was funded by UAL to undertake a week-long research residency at Cylinders in August. The main purpose of the residency was to look at future possibilities for residencies and research work at the Merz Barn for UAL students. ‘Ouroboros, ‘the snake that eats its tail’, is an exploration of the transformative power of collage. It includes recycling, upcycling, the personal and the universal, the implications of ‘selfie culture’, the relationship between art and time, part and whole’. The Ouroboros ‘Transformation of the Discarded’ exhibition features the work of OPAO (All Possibilities Are Open), a recently formed group of artists based in Kendal – Steve Trevillion, Annie Coxey, Delcia McNeil and Rosie Wates. The group has been working in and around the Merz Barn throughout the year to produce the current exhibition for the Shippon Gallery and the Merz Barn Cake Room. At the opening on August 5th, which was graced by brilliant sunshine, cakes and tea were served from the Merz Barn Cake Room, and dance and spoken improvisations took place in the Merz Circle and the Shippon Gallery. The Ouroboros exhibition was the first stage of a longer term project in which the artists will be working in and around the Merz Barn to prepare a series of artworks, performances, and educational projects involving other artists and young people in the region. OPAO have a related Ouroboros exhibition opening at Kendal Museum on September 12th, Private View 3 – 6 pm – all welcome. The exhibition continues until October 3rd. Keep an eye on the Merzbarn Langdale FaceBook page for details of future events! ‘MERZ IN THE MOMENT’ – Exhibition by members of the Abbott Hall Dementia Group. PRIVATE VIEW: Friday, August 3rd 2018 at 2pm. Shannon Quigley, Curator of the Abbott Hall Dementia Group exhibition ‘Merz In the Moment’ in the Merz Barn. The ‘In The Moment’ Exhibition goes up! CHRIS ROBERTS: COLLAGE-BASED EXHIBITION of works produced during his week-long July residency at Cylinders. The first night bonfire: students from the Royal College of art round the bonfire with Steve Grundy and his concertina performing a selection of Cumbrian and Irish traditional songs and tunes. Drystone walling with Steve Grundy and Ian Hunter, July 15th; and Charlie Whinney, steam-bender and artist, with Steve Grundy, July 16th. The Summer School project for July 19th was to ‘reconstruct’ the lost collage created by Schwitters on July 19th 1919. The original was hung derisively upside down at the 1937 ‘Entartete Kunst’ exhibition in Munich. Project master-minded by artist Mike Healey (in hat), here seen with Ian Hinde, who performed a version of Schwitters’ ‘Ur-Sonate’, and Steve Grundy, who provided the music. Impromptu dancing display by the RCA students, with Steve on the accordion.